Albert Boime, Art in an Age of Counterrevolution 1815-1848 (Chicago, IL and London: The University of Chicago Press, 2004), p. 40. 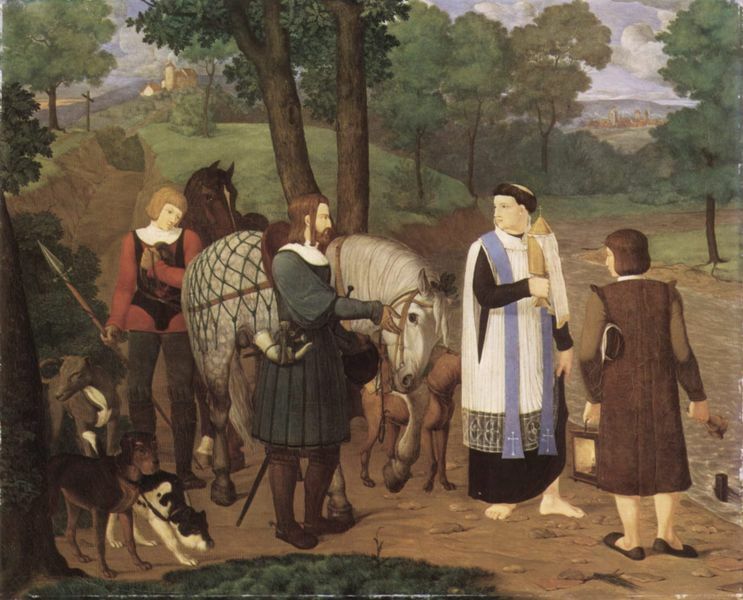 “This fusion of nobility and the artists’ personal world finds its ultimate expression in the cameo appearance of Pforr, who imagines himself as a valiant squire among Rudolf’s entourage (Pforr enters the picture on the far right as a young man with black beret, who looks back over his shoulder). Pforr’s self-portrait reminds us of the Lucasbrüder’s [Nazarenes’] tendency to identify with their subjects…and to use them as means of reflecting upon their personal situation. Such commentary could include artistic expectations as well, as in Pforr’s case, where the advent of a new Rudolf comes with the hope that a genuinely Christian government would also herald an era of sustained patronage….Pforr’s mixture reflects the Nazarenes’ general obsession with temporality, as it serves to fold biblical into post-biblical time and, further differentiating the play of temporalities, to forge a link between medieval past and actual present. Pforr’s self-portrait marks the intersection of these various time axes. His horse carries him forward in Rudolf’s wake…on his way toward the procession’s final destination, the town’s medieval cathedral. Yet, while Pforr’s body moves toward a moment of historical completion, his gaze disengages with this view into the glorified but lost past of perfect piety. As the only figure in the painting to look backward, he gazes toward the right, fixing his eyes upon a point beyond the picture frame. Pforr looks into the future. In him, the picture’s two central aspects converge: his gaze unites the insight into God’s order (typology) with an understanding of the moral lessons that can and should be learned from history (a history past and yet available through the archetype). Cordula Grewe, Painting the Sacred in the Age of Romanticism (Burlington, VT and Farnham, Surrey: Ashgate, 2009), pp. 51-2. “In its emphatic medievalism the picture predates the Lucasbund’s subsequent Raphaelite turn, a turn generally mourned as the death-sentence for the movement’s aesthetic potential. The Entry of Rudolf of Habsburg, however, is not only significant in stylistic terms; it also stands out for its hermeneutical complexity. Pforr’s image seems the first among the Lucasbrüder’s compositions to explicitly visualize figural relationships and, through a juxtaposition of medieval and Old Testament history, articulate a typological structure of post-biblical time. Cordula Grewe, Painting the Sacred in the Age of Romanticism (Surrey UK and Burlington VT: Ashgate, 2009), 53-4. “Pforr rejected mere appearance and strove for truth (the motto of the Brotherhood) by developing a linear and planar style which he associated with the authenticity of earlier painting. Mitchell Benjamin Frank, German Romantic Painting Redefined. Nazarene Tradition and the Narratives of Romanticism (Aldershot, UK-Burlington, VT: Ashgate, 2001), 94-95.